Woodworking Made Easier With The Best Belt Sander! 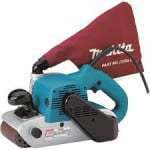 A Belt Sander is an essential tool for any wood/metal worker or a DIY person. It cuts down several hours of work required to smooth out wood or metal surfaces in any project. You also don’t have to deal with the dust from the process which is sucked into a dust bag attached to most of these sanders. Some of the top selling belt sanders in the market are Makita 9403, Hitachi SB8V2, Makita 9903 and Porter-Cable 362V. The comparison table below gives us an idea of the specifications and features of the four best belt sanders listed above. 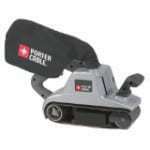 A belt sander is a power tool which is used to smooth and shape a wooden or a metallic surface. It can also help in removing paint and rust from the surface. There are two types of belt sanders, the stationary and the portable. This review has concentrated on the portable versions. 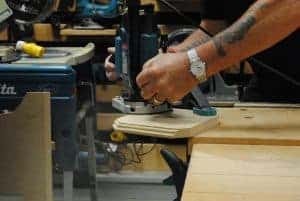 Like most power tools, the belt sander also has a lot of features that you need to understand before you make a decision on which one to buy. Motor Size& Belt Speed: A powerful machine with high belt speeds can make your work faster, but they are also more difficult to control. A good compromise is to buy a motor of 8-10 amps with a variable speed adjuster as this allows you more control over the amount of material being removed and the area being covered. Belt Size: The nomenclature used is width x length of the belt. Widths for handheld sanders vary from 1-4” and but a 3×21” is the industry standard which allows you to cover large areas and is convenient to handle. Type of belt: A standard belt is made of aluminum grit, but zirconium grit is used for more heavy duty work. Dust collection: From a health perspective, ensure that you have a good dust collection system with a strong and large bag with your sander else all the dust from the sanding process can make you ill. Weight: A heavy sander reduces the need for additional pressure during sanding; however, a very heavy sander is uncomfortable to work with. To have a better understanding of the above-mentioned belt sanders; let us take a look at their detailed reviews. Makita 9403 is a one of the heavy-duty commercial grade belt sanders made by the well know Japanese manufacturer of power tools Makita. They have been producing power tools for over a hundred years. A variable speed adjustment switch which can switch between 690-1640SFPM. Specially engineered seals in the motor section. Replaceable ceramic plate attached to the belt. Makita 9403 is a powerful machine with an 11 Amp motor which is one of the highest powered motors for sanders in the market today. This power ensures that the machine has a maximum speed of 1640SFPM. It has a variable speed motor which can be adjusted with a switch. The belt is wide and large at 4x24inches which will eat through the material being sanded rather quickly. It uses a trigger in the anterior to control the machine. This is a heavy sander at 13 pounds and thus no additional pressure needs to be applied while using it. The auto track feature helps keep the belt in the center. Its claim to fame is that it is the quietest sanders in the market operating at 85 decibels of noise. Makita 9403 is made of high-quality materials which are expected to last for a long time Examine the belt regularly for wear and tear. The ceramic platen does not heat up like the stainless steel ones do and thus allows the belt to last longer. Too heavy to work on vertical surfaces. Automatic belt tracker tends to break down after some time. Makita 9403 is available at most hardware and home improvement stores. For great deals check online on sites like amazon.com. It is an expensive sander, but it delivers the punch required. 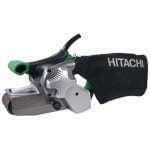 A powerful, yet small and affordable belt sander, the Hitachi SB8V2 has been manufactured with durability in mind by Hitachi, a well-known power tools brand. Variable speed adjustments switch which can switch between 820-1475SFPM. This is a small-sized sander with a powerful heart, a variable speed 9amp motor which helps it have a maximum speed of 1475SFPM. This speed is higher than most machines of its size. It has a switch to manage the speed between 820–1475SFPM. It has a pistol type trigger as an on/off switch which is at 45-degree angle. This angle makes it easier to apply pressure while pushing the sander forward. There is substantial front grip unlike other sanders of its size which allows for a more comfortable and convenient woodwork. Weighing in at 9.5pounds it is heavy enough so that additional pressure need not be applied by the operator but is lightweight enough to be used comfortably for short periods of time on vertical surfaces. One unique feature of this sander is the design of its nose. There is a transparent plastic panel above the exposed nose which helps manage and control the sander so that you don’t accidently damage any perpendicular surface. The sander is designed for easy maintenance like a push lever to replace the belt and use of industry standard parts which means finding replacement parts is easy. It also sells them online on its website. It has a built-in dust collection system with a detachable cloth dust bag. This sander has been designed with durability in the forefront. It has a v-belt design which doubles the life of the belt. The 5-year warranty that Hitachi offers is the longest among its class of sanders. It reflects the company’s confidence in the quality of its products. Available at most hardware and home improvement stores, but for great deals go online to amazon.com. It is one of the cheapest belt sanders. Makita 9903 is one of the belt sanders from Makita, which is a well known Japanese manufacturer of power tools. A good sander needs to be heavy and weighing in at 9.5pounds, this sander is just heavy enough to get the work done. The auto track feature helps keep the belt in the center. With just 85 decibels of noise output, it is one of the quietest sanders in the market today. Makita 9903 is made of high-quality materials which are expected to last for a long time. The belt will need to be replaced from time to time depending on the amount of usage it is put to. Expensive especially since a case is not supplied along with it. Makita 9903 is available at most hardware and home improvement stores. It is also available online on sites like amazon.com which offer great deals. It is a little expensive, but it is worth it considering you are paying for Japanese quality. 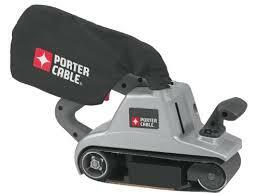 This belt sander from Porter Cable is the most powerful of all machines in its class. 90-day money-back, 1year free service, and 3-year limited warranty. With a 12amp motor and a 4×24” belt this sander is the most powerful, and with a weight of 15.5pounds, it is also the largest and the heaviest. This sander is designed for heavy-duty work. The weight has the added advantage of the operator having to put less pressure while using the sander. It has a variable speed adjustment switch and can sand at a maximum speed of 1500SFPM. The machine is well balanced with motor placed at the center of the machine. 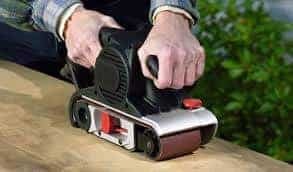 It has a quick release knob to replace the belt. It uses a premium 100grit zirconium belt. The handles have been designed so that you have a trigger grip for your dominant hand and a forward grip which helps you control the sander comfortably and securely. The dust bag can swivel 360O so it can be moved out of your way. Porter Cable products are known for their design and durability, and the 3year warranty offered by the company reflects their commitment to the same. It is mostly made of metal which tends to heat up when used for a long time. Check out for great deals online on websites like amazon.com. It is also available at most hardware and home improvement stores. It is expensive, but you are getting an absolute beast of a machine for it. 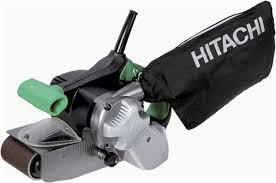 The Hitachi SB8V2 is not only the most affordable of the best-selling belt sanders that we have reviewed in this article, but it is also feature-rich. It is designed for durability and easy maintenance. It has a mid-sized motor and a standard belt which can be used for most wood and metal working projects. It is the best choice for DIY and semi-professional workers.